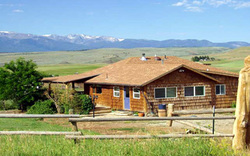 The Diamond C Guest House is located just outside Fishtail, Montana on the Bass Ranch. We are surrounded by majestic views of the Beartooth, Absaroka, and Crazy Mountains. Our 'Cottage Lodge' is a warm retreat that can house a large reunion up to 18 people or just one couple looking for a romantic getaway. The house consists of an 'Upstairs', a 'Downstairs' and a 'Bunkroom', each with separate entrances. The 'Upstairs' consists of two bedrooms (1 queen and 1 double bed), a full bathroom, laundry facilities, fully equipped kitchen with dining, living area and wood stove. Upstairs also has satellite TV, with VHS/DVD and telephone. The covered deck has a BBQ, dining and lounging area. 'Downstairs' is a bit smaller with only one bedroom. It has a queen bed and a set of bunk beds. The living area has a sleeper sofa, utility kitchen, small dining area and a three-quarter bathroom. The covered porch has a BBQ, dining and lounging area. The 'Bunkroom' will sleep four singles and two doubles - totaling eight. It has its own large three-quarter bathroom. The yard accommodates a small walled tent that can sleep four, a permanent campfire ring, and horse shoe pit. Neighboring the yard is our lambing pens and home to some of Diamond C's gentler critters. Bass Ranch does not offer any ranch participation activities, however much of what we do is visible from the house's two covered porches. Horseback riding and overnight pack trips, fly-fishing, white water rafting, kayaking, four-wheeling and other activities are available nearby. We are 65 miles from Billings and 40 miles from Red Lodge. Yellowstone Park, Paradise Valley, Chico Hot Springs, Bozeman and countless Blue Ribbon trout fishing steams/rivers are all within a 2-hour drive. Local, life long guides possibly available. We will gladly send you names, phone numbers or web sites, if requested. On the Ranch we are busy with farming in March and April, lambing in May, foaling, irrigating and working lambs in June, haying and sheep herding in July, August and September, irrigating all summer long. All of which are interesting and fun to watch up close or from the comfort of Diamond C's covered porches. Bass Ranch is also home of the Diamond C Critters. We are a traveling petting 'zoo' that helps raise money for our local communities featuring Batu, our handsome Yak and his girlfriend Isobelle; the beautiful Scotch Highland/Black Angus cross. We also have Rowdy, a small paint pony, Chocolat our flirtatious Llama and Lightning our stoic Nubian goat. Then we have our sheep, which include Jacob, Karakul, Navajo Churro, Merino, Icelandic and Border Leicester breeds. There are also geese, chickens, and ducks, along with way to many horses and cats and our trustworthy Border Collie McDuff. So, if you and your family love the outdoors with all the comforts of a cozy country home, surrounded by spectacular views and animals of all shapes and sizes, then the Diamond C is the place for you. We hope to welcome you to Montana and all it's splendor. There is a three night minimun stay, deposit is required for advance reservations and a two week cancellation period for refunds. Directions: Diamond C Guest House at Bass Ranch: On I-90 take Exit 408 at Columbus and follow signs through town to Highway 78 South to Absarokee. Three miles south of Absarokee turn right onto Highway 419 (at Olie's gas station) to Fishtail. A quarter mile outside Fishtail take the first right onto Grove Creek Road (gravel road). Proceed about 1.71 miles on Grove Creek Road to Diamond C Guest House just past the Bass Ranch mailbox.